As I’ve mentioned several times, Sarah and I are making a special effort to spread out our trips to the grocery store – and with some real success. Part of this is simply using things that we’ve had in the refrigerator, the cupboard, and the freezer for a while. One item that’s been in the fridge for a bit are some rolls of prepackaged pizza dough that we got on sale a few months back. We like to make our own pizza crust, but the price was low enough on the prepackaged pizza dough that we simply bought some. How do we use it, though? Usually, when we make pizza, I just make a crust from scratch. The solution was obvious: sandwich pockets. We simply take ingredients that we have on hand, fold pieces of the dough around those ingredients, and bake them in the oven. 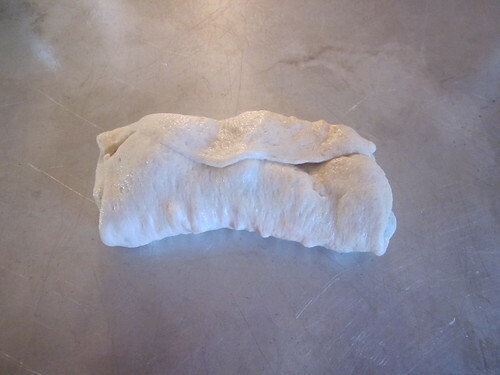 Last night, we made two large batches of these sandwich pockets. One variety (the one I took lots of pictures of) included broccoli, fresh chives, and cheddar cheese. I also made some pockets using bell peppers and ricotta cheese. Both types included a mix of dried herbs (oregano, basil, and so on). 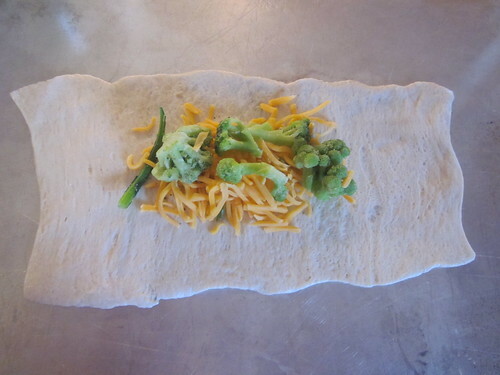 To make four pockets, you need a roll of refrigerated pizza dough (or a small batch of homemade dough), the ingredients you wish to put in the middle, some salt and pepper to taste, and a single egg. If you’re using any fresh vegetables in these pockets, chop them in advance. This always saves time. 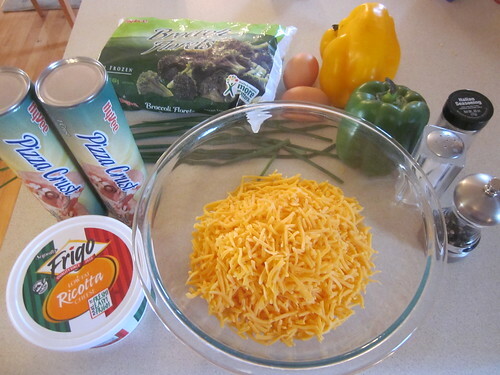 The first thing you’ll want to do is mix together your filling ingredients. For me, this means for four pockets, I’ll mix together a cup and a half of broccoli, a cup and a half of shredded cheddar, a dash of salt, a few dashes of ground pepper, three tablespoons of chopped chives, and a few dashes of mixed dried herbs. I simply toss all of this stuff together with my hands until it’s reasonably consistent. After that, I unroll a container of the pizza dough on a surface lightly coated with flour or with canola oil to prevent sticking. 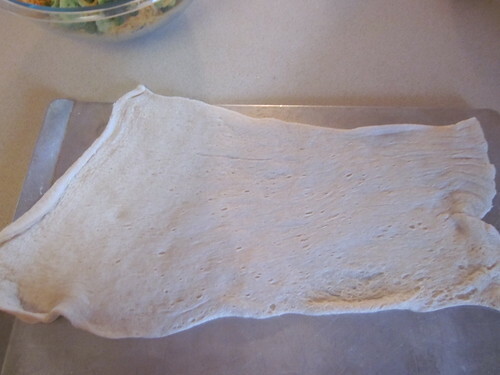 Cut this pizza dough into four equal pieces. In the center of each piece of dough, put roughly a quarter of the mixture. Simply fold over one side on top of the mix, then fold over the opposite side. After that, fold the remaining two sides over the mixture, forming a pocket. Easy as can be! Crack an egg into a bowl and beat it with a fork. Then, brush the egg on top of the pockets. This will create a wonderful golden crust on top. 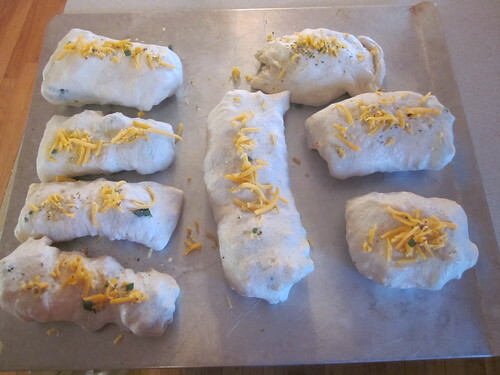 Preheat the oven to 425 F, then place the finished pockets onto a baking sheet that had lightly been coated with canola oil to prevent sticking. When I had the sandwiches all ready to go into the oven, there was a bit of the mixture left over, so I sprinkled some on top of each of the pockets. Here’s eight of them, ready to go into the oven. Bake the sandwiches for fifteen to seventeen minutes, until golden brown on top, then serve. 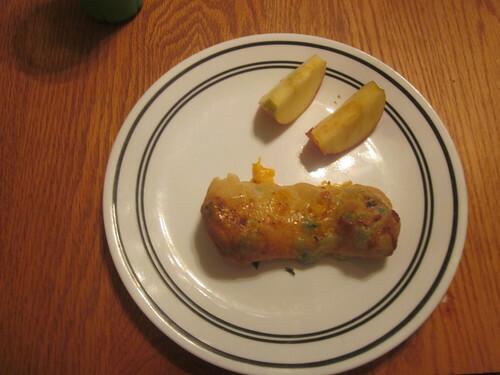 We had some sliced apples along with the sandwiches, making for a great lunch or a light dinner! Obviously, you can put pretty much anything you want into these pockets. One thing I like about these is that you don’t have to stick with what you might think of as pizza toppings. 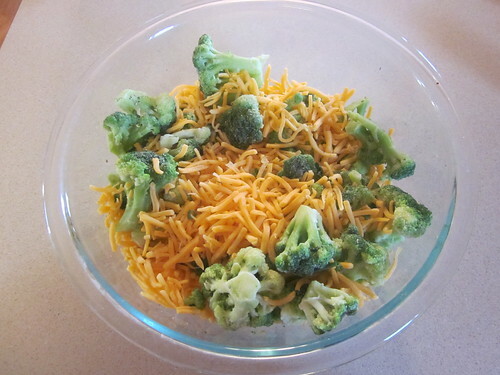 It might seem odd to put broccoli on a pizza, for example, but it works perfectly here. Just use roughly three cups of filling for every four you make and let your imagination run wild – meats, vegetables, cheeses, mushrooms, whatever you want.